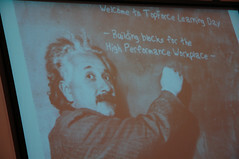 Last Friday was a great day, our learning day with as central theme: the High-Performance Workplace. You can revisit the day by visiting the Flickr set. A learning day? It is a knowledge sharing day. As an information company we can gain knowledge by sharing it. A boomerang for Jasper, in the hope that he will find the way back after his travel around the world. We can use our ecosystem of ISV’s and partners to get things done, for example: Sweetlets. So what is the High-Performance Workplace? It is a growing subject of which we will hear much more in the future. You can read about it at Gartner’s HPW blog. And you can be part of it by defining what a High-Performance Workplace is. Socialize on the internet, combine your life with your e-life on Hyves, Myspace.com, Flickr and LinkedIn. As TopForce we can bridge the gap between the SAP world and the information worker’s real world. Our mind shift has to change from technology to people. A portal is not a goal. MDM and BI are the cornerstones for a successful High-Performance Workplace. See the HPW as an iceberg, the portal is ‘only’ the tip that is above the waterline. We all know that there is still a whole lot under water. Business is leading and IT is supporting. The main focus must be on the business process. It is about tightly integrated collaboration functionality. The collaboration portal. But most important to become an unbeatable effective company that is world famous we need a marketing campaign. Maybe we can shoot a video and place it on YouTube. It worked for BearForce ;-) Any volunteers?